This weekend, followers of the One True Religion around Australia will gather for the AFL Grand Final (with apologies to Rugby League Protestants who will celebrate their special day next weekend). The Feast of the Grand Final has a great deal in common with celebrations in our other religious traditions. Events such as Christmas and Easter, or perhaps saints' feast days, are celebrations of the stories that help fashion the identity of Christians. Telling these stories each year helps us create our own new stories about the values or beliefs we follow. The Grand Final has its own stories that tell us about ourselves, as well as rituals that personalise those stories for each of us. It starts with the game itself. The Grand Final isn't like other football games. Small moments in a Grand Final have the power to resonate through the years. Think of the 'Jesaulenko you beauty' mark in 1970, Kevin Bartlett's roving goals in 1980, the groggy Dermott Brereton being escorted from the field in 1989, Gary Ablett's moments of brilliance in defeat in that same game, Michael Long's running bounces in 1993, Leo Barry's mark to seal the game in 2005, and many other great moments. These stories capture something of the deeper meaning the game has to people. They celebrate the physical skill required to reach the top, and the fact that skill alone is not enough, that winning requires a combination of luck, timing and environment. These are messages that speak to people's experiences beyond the game itself. Of course, the stories on the field aren't always fully representative of our society. For one thing, it's a decidedly masculine story that's being told. The AFL's MCG temple, like some other religious spaces, almost completely excludes women from participating. Generating stories that can inspire and inform across genders is an issue for all sports, but for codes such as the AFL and Rugby League — which don't even have elite professional women's competitions — it's particularly problematic. We do need to bring more female stories to the AFL religion. For starters, our broadcasters could at least include more women in their coverage of the games. Although we have some great female journalists such as Caroline Wilson, chief football writer for The Age, we could be told more stories of women’s involvement in the game. But as the familiar Footy Show theme tells us, 'it's more than a game'. The Feast of the AFL Grand Final is as much about the rituals and the traditions that grow up among the people in the pews as it is about what happens in the temple of the MCG. These events are more reflective of our broader society, with women welcomed equally in the cheering alongside men, along with people of various cultural and socio-economic backgrounds. I'll be organising a barbecue with my friends on Saturday, and even that event will have its own obligatory rituals. We'll be putting our money into a jar and making predictions before the game as to which team will win, the margin, the first goal kicker and the Norm Smith Medallist. We'll also add some other predictions to the list, which depend on the teams that are playing — such as the time of the game when we'll see the first shot of Jeff Kennett on television (my prediction: the ten minute mark of the first quarter), or the first time we'll see Ryan Crowley wrestling with another player (prediction: before the first bounce). There'll be kick to kick on the street at halftime, and someone's car will inevitably get hit by a football. At some point during the second or third quarter, those more interested in socialising will retreat to another room, leaving the 'true believers' to their worshipping. They might come back before the end, if the conversation allows. The weather this weekend looks like it's going to be terrible, but unlike a month ago, that won't be enough to stop people from gathering for their barbecues. Grand Final Day marks the turning of another season in Australian life — from the winter months, when our time is spent indoors and our mood is often more introspective, to the summer months when the weather allows us outside, and our mood becomes more social. It will be followed over the next few weeks by the Spring Racing Carnival, various music and cultural festivals, weddings and baptisms, then the rush to Christmas and New Year. If there's an underlying theme of Grand Final Day, it's the celebration of a time of reflection giving way to a time of action; of overcoming the testing winter and launching ourselves into the abundant summer. Easter in Australia loses some of its 'new life' symbolism in the southern hemisphere, coming as it does in autumn. The Grand Final doesn't make up for that loss, but the themes are still there in a smaller way. Michael, your final remarks come closer to explaining the special feeling in Melbourne at the Grand Final than your trope of religion. It’s about Spring. 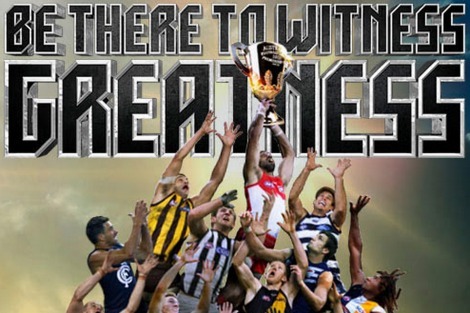 Between the Finals and Cup Day Melbourne emerges from Winter and the Grand Final is one of the great unspoken triumphs of nature overcoming the gruelling struggle for survival. It is a rite, albeit a rite in which as you observe women are absent. Stravinsky is not the half-time entertainment, but the colours are there, each year a different colour to celebrate the fecund multi-coloured beauty of the world coming back to life. The air is fragrant with blossoms as the people go down to the ground of festivity, or enjoy it in the refreshing atmosphere of their own gardens and homes. Each of us waits our turn to be once more the main totem, in my case that of the tough and proud harbinger of Spring, the Magpie. An interesting and amusing piece, Michael. Extremely amusing indeed, as most things to do with "footy" are. I suppose, given the lack of a national epic that older cultures have, such as the Ramayana or Kalevala, in post 1788 Australia, or at least the southern states and WA, "footy" and the culture thereof is the nearest thing we have to one, even more so than Anzac Day, I'd say. The origins and history of Australian Rules have much to say about the national character. Invented by an Old Rugbeian, with its first recorded match played between two very "posh" Melbourne schools, Scotch College and Melbourne Grammar, it quickly became a mass sport. Some areas identified very strongly with their football teams. This was when Fitzroy was in Fitzroy, then very much a gritty, working class suburb. The "toffs" barracked for teams like Melbourne. With (crass) commercialisation how things have changed! We worship glamorous youth. You really have to have an exceptional physique, stamina and coordination to master all the kicks and play at that level at speed. Of course footballers, like all male sports stars, attract glamorous women, who are usually seen and not heard. Their conduct, towards women and also in regard to matters such as the fallout from Essendon's now discredited supplement program, is all too predictable in this country, in sport; in politics; in business and in the Church. No one is responsible for anything and will legally defend themselves to the last. Religious? Post- religious, entirely materialistic and often (sadly) self-centred and self-serving. A good game though. There's irony there.